Sue: So what’s gone wrong with the titles this time? It’s a good question. 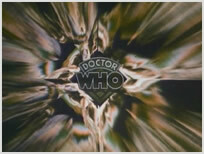 For some reason, the title sequence for Part One has been rendered in sepia tone. We both agree that it looks terrible. In fact, the only good thing about these titles as far as Sue is concerned is Robert Holmes’ name. Sue: What’s an inflatable toy doing floating in space like that? Me: Are you going to be like this all the way through, Sue? Sue: Struck a nerve, have I? I can tell you like this story before we even start. Sue: Well, first of all, you suggested that we watch Doctor Who tonight, instead of it being me as usual. Secondly, I heard you trying to coax Nicol downstairs. “It’s brilliant, honestly” you told her. And thirdly, you’re being very defensive and we’re only a minute in. Me: I just thought we’d passed the point where a slightly dodgy special effect would cloud your judgement, that’s all. Sue: We have. I just like winding you up. Well it’s definitely working, mainly because we’ve arrived at a story that I genuinely love, and having my wife mock it isn’t a pleasant sensation. I have fond memories of the last two Pertwee seasons, but they are nothing more than fragmented vignettes. The Ark in Space is where I really became invested in this show, and having its magnificence called into question by your significant other isn’t something I’d recommend. Sue: (Sensing my agitation) Nice TARDIS materialisation. Me: I could be wrong, but I think that’s the first time we see the camera move when the TARDIS lands. That’s because they didn’t use the traditional roll back and mix technique. They just turned up the lights a bit. We watch the materialisation again, just to be sure. Sue: It works. Well done. Me: I told you this was brilliant. As the adventure gets underway, Sue wants to talk about Harry. Sue: I’m not impressed with him so far. He’s just a posh berk who looks like a young Michael Ball. As our heroes explore the Ark, they suddenly realise they are running out of oxygen. Sue: I think they’ve seen quite enough of this place now. If it’s so uncomfortable, why don’t they just sod off back to the TARDIS and try again? And when does the Doctor’s TARDIS start working properly? They keep promising a working TARDIS, and yet they keep failing to deliver one. Sarah ends up being hypnotised. Sue: Sarah Jane is clearly off her head in this scene. On Ecstasy by the look it. They should be playing some Floyd instead of this pompous classical music. It’d be more relaxing. While Sarah snoozes, Harry’s shoes are obliterated by the Ark’s security system. Sue: Does Harry end up like Bruce Willis in Die Hard? 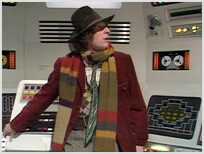 The Doctor disables the security system, but not without great personal cost to his scarf. Sue: Does the Doctor have burn marks on his scarf from now on? And do the fans who knit their own versions of it put the burn marks on there as well? I’m sure it’s full purl, by the way. Sue: Oh look, Sarah Jane is having a sauna. Have they arrived at a futuristic spa or something? When the action shifts to the Ark’s circular corridor, Sue perks up considerably. Sue: Now that looks great. That’s probably the best set design I’ve seen in this show so far. It’s quite impressive for 1975. About bloody time! But it doesn’t last. 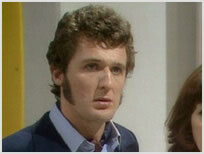 Sue: The problem with Harry is the last time I saw sideburns that big, Noddy Holder was attached to them. And I’m pretty sure he was taking the piss. The Doctor and Harry enter a cryogenic storage facility. Sue: These bodies look plastic to me. Are the Autons up to no good again? I hush her as the Doctor launches into what can only be described as an indomitable monologue. Me: It’s so good, David Tennant paraphrased it in the new series. Sue: Really? I don’t remember that. Me: He probably burped in the middle of it. Anyway, could you imagine Jon Pertwee delivering a speech like that? Sue: Not a chance. He would have insulted the human race instead. The episode concludes with a Wirrn falling out of a cupboard, at which point Sue turns to me, smiles a slightly condescending smile, and slowly shakes her head. This particular Wirrn is already dead. Sue: It looks like a giant poo with green bits sticking out of it. A woman named Vira emerges from her cryogenic slumber. Sue: The polystyrene’s a bit squeaky when she steps on the set. They should have thought that through. Hang on… Is that Sue Lawley? Vira wants to know what Harry and the Doctor are doing on the Ark. Sue: I love the line about Harry only being qualified to work on sailors. Tom Baker is practically laughing his head off when he says it. He really seems to be enjoying himself. Vira injects Sarah with antiprotonics, even though there’s a 50 per cent chance they could kill her. 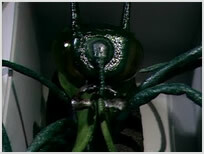 Sue: She could have told them the odds before she stuck that thing in Sarah Jane! Her bedside manner is appalling. The next occupant to be revived is the Ark’s commander, Noah (real name: Lazar). Sue: So his real name is even sillier than his nickname? How does that work, exactly? 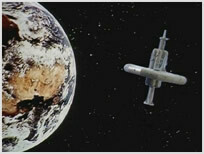 As Harry and the Doctor argue with Noah, a maggot-like creature is seen entering the inner-workings of the space station. Sue: I’m not even going to comment on that. 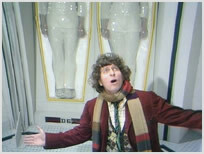 But I have noticed something interesting: Tom Baker is a very odd shape. Sue: I wouldn’t call him fat, exactly, but he seems to be carrying a lot of weight around his mid-section. Me: That’s all the crap in his pockets. Noah is worried the Doctor and Harry will corrupt humanity’s gene pool. Sue: Do they really believe Harry will shag an unconscious woman in a plastic container? That’s a bit of a leap. Sue: The outfit she came out with is definitely better than the one she went in with. 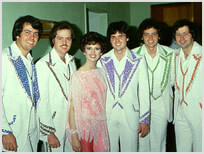 Actually, I’m sure the costumes in this story are influenced by the Osmonds. Sue: The Osmonds were a very influential group, Neil. I’m sure they wore white uniforms like that. Me: That’s weird, even for you. 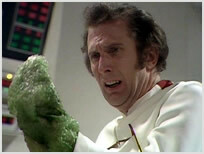 As the Doctor investigates the Ark’s solar stack, he encounters a green organism bubbling away in a tank. Sue: Giant tadpoles. That’s quite unpleasant. Even Tom Baker was freaked out by that. The Doctor tries to reason with Noah, who is now acting very strangely indeed. So strangely in fact, he shoots the Doctor in the middle of a sentence. Sue: Has the Doctor been atomised? That was a very short run. Me: Still longer than Paul McGann’s. When the Doctor regains consciousness, he picks up the sentence where he left off. I turn to Sue and notice that she’s grinning from ear to ear. And then the Doctor describes the Wirrn’s reproductive habits in gruesome detail. Sue: So this is basically Alien? Me: There are certain similarities, yes. Sue: How did they sneak this idea into an afternoon tea-time slot? It’s horrific. Me: This story gave me nightmares when I was a kid. I couldn’t hide behind a sofa, though – ours was pushed up against the wall – so I had to use a cushion instead. In fact, I’m sure The Ark in Space gave me nightmares. Sue: Yes, and you’ve been terrified of bubble wrap ever since. The episode concludes with Noah definitely not feeling himself. Sue: (Pointing at Noah’s infected hand) Now that’s going to **** up the gene pool. Noah struggles against the Wirrn inside him. Sue: I know I should be laughing at this, but the actor’s performance is selling it to me. Even though it’s just some bubble wrap that’s been sprayed green – there’s no getting around that fact. Me: You have to remember bubble wrap was quite exotic in 1975, it wouldn’t have been so familiar back then. Give them a break. Sue: You never got this defensive when I criticised the monsters in Jon Pertwee’s stories. Me: Yes, but this is an incredible performance from Kenton Moore. Look at the anguish etched into his face! It’s incredible! Sue: He looks like Rod Hull practicing with Emu in his bedroom. It doesn’t help that if you can make out a little face on the bubble wrap. Can you see its eyes and nose? But full marks to the actor. He managed to bang his hand on that desk without popping it. As Noah succumbs to the Wirrn, Vira laments his passing. Sue: Maybe they can pair-bond Harry with Sue Lawley. Does Harry stay behind to revive the human race? That would be nice. Me: You don’t like Harry very much, do you? Sue: I just don’t see the point of him. Oh look, somebody’s crawling around in a green sleeping bag. But what can you do? As long as the actors believe it, I can believe it. 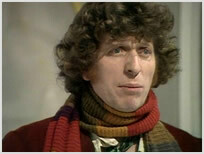 And Tom Baker looks like he really believes it. Having said that, when the Doctor and Sarah are attacked by the same creature later, the story reaches a low point for Sue. Sue: Run away from it! It’s literally moving like a snail. 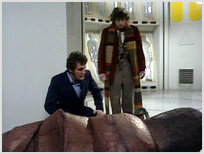 The crew keep the hungry caterpillar at bay so the Doctor can plug his mind into a dead Wirrn’s brain. This isn’t as daft as it sounds, because he discovers that electricity could be the key to their salvation. Sue: Why didn’t the Doctor work that out after what happened to Harry’s shoes? They should have guessed that ages ago. It’s so obvious – they spent a whole episode trying to switch the bloody electricity off. Noah reaches the final stages of Wirrnhood. Sue: I could have done without the shaky dissolve, thanks. In fact I can’t say I’m impressed with the direction in this story. It’s okay, but it’s nothing special. Sue: Okay, it’s stopped being like Alien, now. I don’t remember the crew chatting with the monster in that film. I’m sorry, Neil, but these monsters are rubbish. What were they thinking? How did they think this would work? I think part of the problem is the story is too brightly lit. Nothing’s scary when it’s filmed under strip lighting. And they should be hiding these monsters as much as possible. The Doctor suddenly realises that the Ark’s matter transporter works both ways. Sue: You can reverse anything in this programme. Everybody knows that. 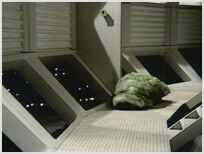 However, when a crew member named Rogin approaches the magic bed, Sue is forced to question the Ark’s ergonomics. Sue: They should have worked out a better way to access that bed. Maybe some tiny fold-a-way stairs. If they had to clean somebody’s piss up, they’d have to trample over the expensive machinery to get to it. Me: What possessed you to think of such an eventuality? Jesus! The Wirrn cause a massive power failure. Sue: This is more like it. Why didn’t they cut the power ages ago? This is actually scary now. They should have lit the whole thing like this. Sarah tries to help the Doctor concoct another cunning plan, but the Time Lord dismisses her out of hand. Sue: Here we go again. Nothing changes. But then, a few seconds later, the Doctor is all sweetness and light as he asks Sarah for her input. Sue: Okay, fair enough. That is a big difference, I suppose. Pertwee wouldn’t have behaved like that. Still a bit rude, though. And does Tom Baker ever blink? I don’t think I’ve seen him blink. He’d be good against the ‘Weeping Statues’ in the new series. Sue: I like the lilac lighting. Why didn’t they shoot the whole thing like this? The lighting in the first three episodes was terrible, but this is really nice. Sarah and Harry start bickering. Sue: You can see how Amy and Rory’s banter could have been influenced by Harry and Sarah Jane. They have a similar chemistry. 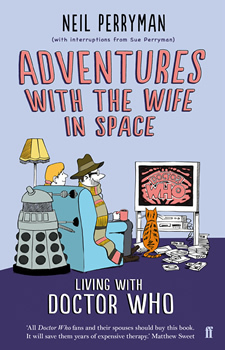 I just hope they don’t start shagging in the TARDIS. Sarah makes her way through the Ark’s ventilation shaft. Sue: It’s definitely turned into Alien again. So when was Alien released? Sue: So Ridley Scott might have seen this before he made Alien? Sue: Maybe he showed it to his crew and said, “I want it to look like that, but with decent lighting, sets, monsters and music”. When Sarah gets stuck in the narrow shaft, the Doctor uses reverse psychology to tease her out. Sue: I knew he was only pretending to be angry with her. If that had been Jon Pertwee, I would have believed his insults. Maybe that’s why Sarah believed him. She’s used to it. The Doctor and Sarah reach the control room, but a Wirrn intercedes. Sue: Just step away from the grill! Sarah Jane is really beginning to irritate me now. Get a grip, girl! 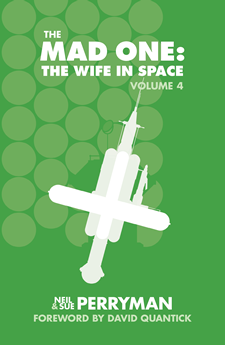 The Wirrn are lured into the shuttle and Rogin nobly sacrifices himself to save humanity. Sue: What a nice man. It’s nice to know cockneys survive in the future. At the beginning, I thought it was only the stuck-up pompous twats who were going to repopulate the planet, so there’s still hope for us yet, love. Noah’s humanity reasserts itself and he blows up the shuttle, killing the remaining Wirrn in the process. But instead of returning to the TARDIS, the Doctor volunteers to fix the Ark’s T-Mat instead. Sue: I thought you said this story was only four episodes long? Why hasn’t this ended yet? Me: They’ve returned to the formula where the stories flow into each other. Sue: So, they come back to the Ark later, then? Sue: So, The Ark in Space has an arc in space? Can you see what I did there? Me: Yes, very good, Sue. As our heroes prepare to leave, Sue becomes very animated indeed. Sue: Hang on a minute… I’ve seen this before! I recognise Sarah Jane’s yellow coat and bobble hat. Me: It’s your first memory of watching Doctor Who with me – almost 19 years ago to the day. But we’ll save that story for another time. Sue: It was good, but it wasn’t great. I admit that Tom Baker was brilliant, and the concept was all right, but the direction was a bit flat and the acting ranged from the very good to the completely bizarre. It could have been a lot scarier, too. I’m sorry, Neil, but the monsters looked ridiculous. Having said that, it flew by. It’s a tough one to score so I’ll give it the benefit of the doubt. Me: That was the first story from producer Philip Hinchcliffe and script editor Robert Holmes. Could you tell? Sue: It did feel a bit different. I couldn’t imagine Jon Pertwee appearing in that story. I could imagine Patrick Troughton doing it, but not Pertwee. I’m glad Robert Holmes is a regular now – his scripts are always a cut above the rest. And the tone does seem to have shifted a bit. I can’t quite put my finger on it, but it’s definitely an easier programme to watch. And no CSO either, which is nice.